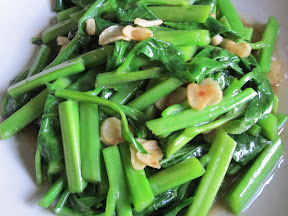 ‘Ceylon Spinach’ is known as the vegetable of the rural people in Thailand. 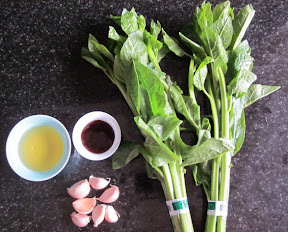 There are many rural dishes that use Ceylon spinach. Though I learned to know about this plant not too long ago, they are quite famous for their vitamins and their fiber content. The fiber content of ‘Ceylon spinach’ is good for cleansing our stomach and their gluey texture is easy on troubled stomachs. This Stir-Fry is extremely easy to do and fast too. At dinner or lunch, a plate of this stir-fry comes first and it is finished even before the table is properly set. Cylon Spinach 2 cups Clean and cut 2 bunches of spinach into 2 inch pieces, take only young leaves and stalks. First fry the cut pieces of garlic in vegetable oil until they become crispy and golden and set aside. Add the Mushroom Sauce on top of the cut pieces of the spinach and throw them in hot wok. Quick stir fry for a short while until the vegetable starts to wilt, then add the crispy fried garlic. Mix them well and it is ready for serving!